Shorten people’s hospital stay – they have to get home to look after their animal. Sedentary people end up getting some excercise because they are forced to walk their dog. Children learn to have tenderness towards their dog and develop compassion – they are introduced to illnesses and death in a very natural way. These are the only issues that are important. His other observations which are also very accurate should be addressed very tactfully in his live interviews. He risks alienating the listener and potential reader. I happened to be browsing an on-line forum and came across one discussing Jon Katz – he had alienated quite a number of potential readers because he made people feel guilty about they way they love their dog. For the women whose dogs are their sole support who cares, why make her feel guilty (ie in his live interview) her dog didn’t cause this situation. For the other lady whose dog is preventing her from making friends – her behaviour was well established long before she had a dog. His best interview was on Fresh Air – he gets the point across without being an arm-chair psychologist. I’ve never tasted human food (my maw-ther mumbles something about my predecessors being a nightmare during dinner hour) and because of this I have to eat kibble which is okay as far as I’m concerned since I’ve never tasted anything else. And I know not to whine or bark for food because of my predescessors( my maw-ther was very strict when I was a pup) – I wasn’t allowed to eat with them in the kitchen and when I was allowed into the kitchen during mealtime – and I misbehaved I was quickly removed. Not many dogs pull sleds these days, and only a few fight crime. But that doesn’t mean dogs aren’t working. Not according to Jon Katz, whose latest book, The New Work of Dogs, explores the less documented duties canines have assumed within family life. Katz’s previous book, A Dog Year, was a popular personal account of the 12 months he spent with two crazy border collies and a pair of laid-back labs, animals that had a transformative effect on his life. 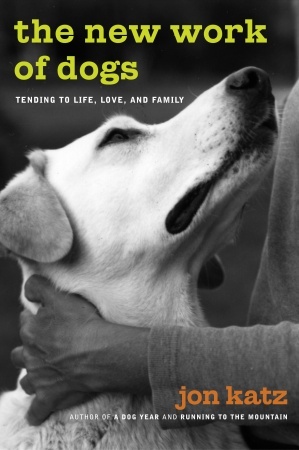 Now, with his new book he takes a look at other people’s pets, compiling the stories of men and women who have hit a wall in their lives and found comfort in the family canine. According to Katz, the new work of the American dog is to be companion, counselor, nurse, even surrogate child. One of his subjects, Sandra Robinson, is divorced, miserable and thwarted in her dreams of having children. She fills the void with a new puppy, Ellie. Rob Cochran feels walled in by the demands of his family and his high-paying job. Through his dog, Cherokee, Cochran vicariously experiences the simple, uninhibited life that eludes him personally. These are lofty roles for our furry friends, but, as Katz shows, they’re up to the task. His list of working dogs is as varied as his register of the people who need them. One chapter tells of the Divorced Dogs Club, a group of divorced women who get together and embellish their list of ways that dogs are better than men. Perhaps the most moving story he tells is of Donna Dwight, a cheerful, dynamic woman dying of cancer whose Welsh Corgi, Harry, accompanies her almost to the gates of death, providing love and companionship all the way. His true work is to save her from feeling alone in the most dreadful hours of her life. And he never flinches, as would so many humans, in the face of cancer’s ugliness. “He might not have wanted to push sheep around, but he was ready to work with Donna,” writes Katz. As his touching new book proves, a good dog’s work is never done.